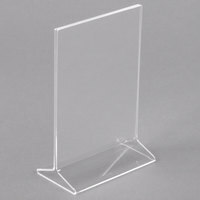 This clear two sided acrylic displayette is an ideal source for your customers to find daily specials or upcoming events. Small in size, this displayette allows you to advertise concerts, seasonal dishes, signature cocktails, and more without losing precious space on your tabletop or counter. This displayette accommodates inserts measuring approximately 4" x 6". The sturdy acrylic material will last long and protect your inserts so that they can be replaced and reused. Really enjoy printing out our specials to display on the tables for customers! Great way to advertise at a low cost. We put it in the middle of the table so customers see it to move it and then catch the specials! Lots of orders from this! Thanks! Super cute for mini menus. They are clear and sturdy. They sit flat on any surface or they can be taped to the table. We placed a piece of paper in the middle to allow them to be viewed from opposite sizes. Great purchase. Sturdy little displays. Easy to change the paper inside, and have stood up to being dropped on multiple occasions. We will be ordering more very soon. Works as we planned for it to work. Acrylic is clear. Stand is firm. It has enough grip to keep a flyer inside. It is nice to use for special of the day display. These table top displays are great for advertising daily specials or seasonal items on your tables. They are rather small but work perfect for tables that do not have a lot of room. Great quality as well. We have looked literally everywhere for these and we just could not find them. We finally found this size and it is exactly what we needed. It is hard finding these tabletop displayettes for so cheap. Sturdy and great size for table side info. I use them for putting up our daily special. It held up well and super easy to clean. The clear acrylic makes for a pleasing display. These were the perfect size displays for our high top tables. We are able to list our events on one side and our daily specials on the other side...without having something that takes up any more space than a couple condiment bottles. Durable, of the 20, none have broken yet! We have had these over 6 months and they are just starting to show wear and tear from being dropped over and over again. I have not had one break totally in half but only chip. Great and easy to use. We change out the cards in these a lot for different specials. They get thrown around and are still in great shape. These clear acrylic tabletop displays are great for writing welcomes to guests. We also use them to identify products on the counter and whether or not these items are for use. These displayettes are perfect! We use them to display our menu items at the festivals. We place them in from of our bakery display and they don't require much space. This product is made of acrylic, and it has an opening at the top for inserting double sided information. This tabletop displayette holds 4x6 inch cards that can be clearly viewed. This tabletop displays are perfect for any advertisement or specials that you want every guest to see at each table. They can break easily if dropped, yet are good for their cost. We love these acrylic displays. We use this size to write notes for specials each day on a piece of paper, or we use an Expo marker on them to reuse each day. very simple and easy to clean. They serve the purpose of what we needed for. They look great at the tables and are very simply. These are perfect for our senior center dining room. We are able to print up information about all our upcoming programs to share with our members. Acrylic tabletop displays are very useful for displaying menu item specials or even drink specials you may be offering. This display is 4" x 6" in can be put in the center of a table to inform your customers of your specials. Simply print out sign and insert into the acrylic display. The four inch by six inch acrylic tabletop displayette is exactly what I had hoped. It is the perfect size and design to hold name cards, reserved signs as well as daily special lists. I have not seen one break or crack, even after many uses. The sleek look and clear color offer a delicacy to any table, and it is tall enough to be seen from a distance. The tabletop displays work great for reserving tables, customer instructions, and community announcements. They are very simple to use and can be used vertically or horizontally. Sir Clean recommended this product 4" x 6" Acrylic Tabletop Displayette, the material is very resistant, it's perfect, not too small not too big, you can use for different purpose. Bought a few of these to advertise my referral program, and they are great! They haven't been dropped yet so I can't speak there but so far so good. Needed a way to display additional items that didn't fit on our regular menu. these are perfect! Not too big, not too small. Easy to load the paper and wipe down well. Have been using them for nearly a year and they still look great! The 4" x 6" Acrylic Tabletop Displayette is great for displaying phone numbers. The quality is very good and the price is excellent. I definitely recommend this product. These displayettes are perfect for showcasing my baked goods names and descriptions. I like that you can display from both sides giving me the option to promote more then one item. This makes it super convenient and more space affective. The 4 x 6 inch tabletop displayette is a nice additional to our tabletops. It seems to be durable and will stand the wear and teat it will get in our place. It was also wonderfully priced, which is always an advantage. This table top display holder is easy to load. Perfect way for us to promote special items while customers are already sitting at one of our tables. Like any acrylic, these are apt to scratch some, but even with some minor abrasion the image comes through clean since it's against the inside face of the acrylic. Clean with a soft cloth (bar towel) and non-caustic cleaner (like windex) and you'll be just fine. These have a small footprint and the size is appropriate for short marketing messages. These are great for displaying happy hour specials or other promotions on your table tops. It also makes for easy to read buffet item signage. They aren't the most high end product but they find ways to be useful. Product is not made well. But in this case you get what you pay for, and this being a very inexpensive holder, that isn't a problem for us. if it is dropped on hard floor, it will most certainly brake or crack. But it does the job! These displayettes are good for the low price. They are easy to use. So far after several months we have not broken any. We change our daily specials and slide the printed menu inside. These displayettes are perfect for showcasing our monthly specials. We place one on each table in our cafe and they're small enough that they don't get in the way but clear enough that the message stands out. I use these for my outdoor customer seating tables. They are simple acrylic displays, but they get the job done. The size is great, not too intrusive on the table, but still big enough for me to display all the information I want. It's easy to slide paper in and the price is great. Cheap but work great. They are easy to put 4*6 paper in and you can see from both sides so don't need to open them too wide. They are nice on tables. I love this product! These table tents are a great size for self-printing specials and new menu items. They are small enough to keep the tables from looking cluttered and allow our guests to still have the room they need. These tabletop displays are nice and durable. They are also very simple to clean, they don't get scratched easily. We highly recommend them to everyone!! What a great buy as I have purchased these in the past from our office supply store and paid twice as much. Very good quality. The 4" x 6" Acrylic Tabletop Displayette works great to display the Christmas holiday for the little ones, "Merry Christmas." on my island. When they come up stairs and see the Christmas sign they know it is officially Christmas You can use normal paper to make the sign. These are pretty standard and simple display tents. We've found them reasonably durable and not difficult to clean. We let them air dry after cleaning using small bar straws to allow air flow between the two sides. These do the job we need them to do. They do tend to lose their ability to hold things in place the more you use them but overall a good value. These are exactly what you think they are. They are easy to load my only complaint is cleaning. They have an opening at the bottom right where the plastic meets up to hold the paper. It is hard to get in there to clean it and they get dusty and dirty from sitting on tables with guests. This gives quick results. It started working from the first day I used it. It brings attention to whatever you want your customers to see without overpowering the table. Want to boost your sales? couldn't imagine something so simple could do so much. Worth every penny and way more. Design with your own paper and spruce it up! This product is affordable and consistent. Signage can be easily measured and inserted into the 4"x 6" space without any hassle. Quick assembly and easy swapping makes it a must have for shops and cafés with ever changing specials. This product is as expected and the price point just can't be beat at any local stores. I have been very impressed with the quality of them versus the ones for 10 times the price at our local store. Items as described. Only had problem with one. Shipped within 2 days of ordering with no issues. Will order from again if they carry what I need at a good price. The perfect touch to any table! We use these for extra advertising and to promote any specials we have going on. They look nice and professional! This is a very durable product that was used to display a promotion at a bakery. After using it for a while, I found that it holds up very well. Great price, but kind of a cheap product. The 4x6 size is okay for standard 4 top table size. There isn't enough tension between the two pieces of plastic to really keep your sign in place for long, I usually stick a bit of scotch tape in with the paper, just enough so its not noticeable and it works good. The displayettes are plain, so what you put in them should really pop in order to grab customers eyes. Works just like I intended them to work. Nothing fancy just a piece of plastic that you stick papers into. The size was fine for my application. The Tabletop Displayette will sale your deserts or specials for you. They work really good. Easy to change out even daily. Had mine awhile now and still look new. This table display is a easy way to let customers know your deserts of the day. Easy to change out. Easy clean and a good item. These tabletop displays are great for making custom happy hour promotions! They are easy to interchange and update as needed! Very attractive and super affordable!!! These are standard table tents, great for displaying new and featured items in your restaurant. It's a great way to promote while your guests are dining! Use of table top tents is pro ven to in crease sales of your items. This is a very clear nice looking display to do this with. We don't use these all that often, but when we do they work fine. They haven't broken which is good, and they do what they need to do. Customers don't like sitting for too long while waiting for their food unless they have something to entertain them. That's why we ordered these displays to include stuff like our special, history, etc. If you include pictures of your highest profit items, you'll notice a rise in sales after using these tabletop displays. Excellent item to showcase food items separate from menu. Easy to display on dinning table.